Brazilian Portuguese voice prompts for Asterisk2Billing (A2Billing) & Star2Billing, the open-source Soft-Switch Billing system. 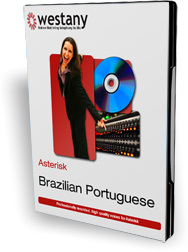 Entire set of Brazilian Portuguese A2Billing & Star2Billing voice prompts are included. Leila for A2Billing includes voice prompts for Asterisk2Billing, Star2Billing and Asterisk all in one package. It also includes specific voice prompts to enable every feature in Asterisk, Trixbox, Callweaver, Elastix and FreePBX. Leila for A2Billing and Star2Billing contains all the voice prompts for each of the six major Asterisk platforms. Namely Asterisk, AsteriskNow, Trixbox, FreePbx, Elastix and Callweaver. If there’s a feature that needs a voice prompt, then we have it in the product. Every single feature from VOIP billing, to voicemail, from IVR, to CTI, from VOIP Calling Card services, to Callback services, from Multi-Currency Balance to VOIP Residential services.